Emails of dog pictures from my family are now neatly organized. …. Or in my case, technology. Google claims Inbox isn’t a replacement for Gmail, its an entirely new product to work alongside Gmail (for now). It’s a smarter way to work through your inbox and organize emails, making sure nothing ever gets lost in the chaos that is a normal email inbox. Staying true to their roots, Google released their new email app through invitations only. The only way to download the app was to be invited by someone who already had it. You can imagine my delight when one of my Facebook friends posted offering Google Inbox invites. My prompt and enthusiastic response (think all caps and a lot of exclamation points) ensured I got my invite. Quick disclaimer: I mainly use the Google Inbox mobile app. I’ve used the desktop version, but for the sake of this blog, we’re going to be referencing the mobile app. So what’s all the hubbub about? Let’s take a look at the new features that position Google Inbox to be a total reinvention of email. The bundle feature is an extension of Gmail’s existing tab feature, which organizes emails by primary, social, and promotions. 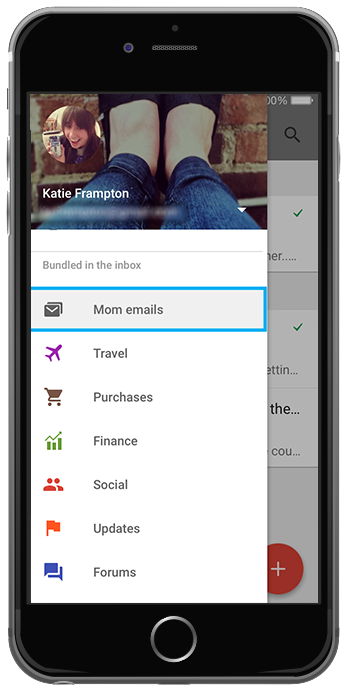 Bundles take this a step further by grouping like emails together. This means you can find emails like bank statements, social notifications, receipts, all together in one place. Over time you can “teach” Google which emails should be bundled together. Inbox pulls all the key information from emails, and as the name suggests, highlights them. Scrolling through your inbox, you can quickly see event dates and times, attachments, even flight itineraries. It goes a step further and, with a quick Google search, includes more information than what was in the original email. 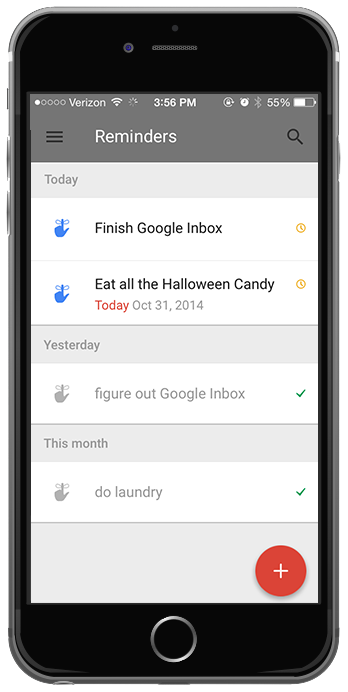 As you go through your emails, you can create a reminder for yourself, right in Inbox. If you need to be reminded of something at a certain time, you can choose to be alerted at a specific date and time, all without leaving Inbox. Assists are the additional information Inbox pulls and includes in your emails and reminders. If you receive an email for a dinner reservation, Inbox will include a map to the email. If you order something, like I did, Inbox will include a thumbnail of the product and include tracking information. How many times have you marked or starred an email with the intention of eventually going back and paying attention to it? And then how many times did you? If you’re like me and answered with a long pause and a blank stare, the snooze feature is for you. Now you can set what is essentially an alarm to respond to an email when it’s convenient for you, whether it’s in a few hours, a different day, or even a specific location. Maybe there are some emails you can’t deal with until you have a cup of coffee at the office, or your sweatpants at home. Now you can set a reminder for when you get to the office, your house, or wherever you need to be to answer your emails. By using Google Inbox, I was able to get a better idea of what was going through my email. So many were just getting lost in the shuffle. As I was playing with the app, I decided to create a new bundle of emails from my mother. She and I email frequently and it would be nice having all of our conversations in one place. If I’ve had one complaint about my beloved Gmail in the past, it would be that I could never organize emails the way I wanted to. Oh, I had filters set up, folders for everything.. but it was so much work on my end. Despite my best efforts, my inbox never stayed organized. But now, Google Inbox does it all for me. It’s smart enough to know which emails to group together. Or, if you’re like me and want complete control, you can start organizing emails (like ones from your mom) with just a few taps. 1. Location based reminders- I avoid allowing apps to have constant access to my location for the sake of battery and privacy. I could see how this feature would be useful. Just not for me. 2. Swiping “done” on emails. I did this a couple of times when I was first exploring the app, but quickly realized it stressed me out. Some people strive for an empty inbox, and I’m not one of them. Even though the emails are still “technically” in my inbox, I don’t like the idea of not being able to see them. For people who don’t want their inboxes cluttered with emails, the “done” feature is great. It just doesn’t align with my personal style of email management. And that brings us to, what I think, is the best part of Google Inbox. People can manage their inbox the way they want. If they want to leave everything in their inbox (ahem- me), they can still organize it the way they want. But it also makes it easy to work through your inbox and dismiss things that aren’t relative while marking important emails in a way that actually works. As much as Inbox has impressed me, I have to wonder what cost I’m paying for all this convenience. When Inbox goes through my emails to find that tracking number for those shoes, or sees how many more notifications I have for Facebook than LinkedIn, what is it learning about me? What is Google going to do with all this information that it’s been mining from all of us? Or the more scary question, what could Google do with all that information? Despite all of this concern about my privacy, I’ve been pleased with Google Inbox and all of its features. But going forward, I may be hesitant sharing information via email and the Internet in general. And for those of you who wonder, no, I can’t invite you. I’ve already used my three invites. Hopefully you’re able to snag invites soon! What do you think about Google Inbox? Tweet us at @Nextfly and let us know what features you will or won’t be using!